The darkest of their films I’ve seen, it’s about a neurotic scientist with one foot who is battling emotional, alcohol and relationship problems. The film is rather unusual as the harsh realism is contrasted by the adopted fantasy of their best known period. The film is visually stunning, something I’ve come to expect from all of the Archers’ work. It is drenched in the noir tradition. Sequences like the “whisky bottle” fantasy seem to have come under a lot of critisism, but I actually think they work quite well, although I’m not a huge fan of some of the sound devices. The film is ahead of it’s time in some regard, mirrowing a bit work of Dali in Spellbound and perhaps Lost Weekend from Wilder. I think this film has both beat though. 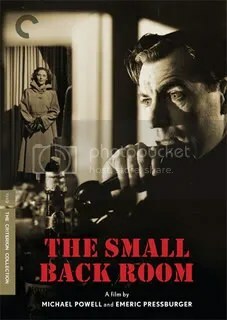 David Farrar is brilliant in the lead role, moving in an entirely different direction than his performances in Gone to Earth and Black Narcissus. He is a commanding screen presence, and makes holds this film firmly down to earth. The suspence is also very effective, and the film generally succeeds on all levels. I only wish it were a touch longer, as it feels rushed, especially towards the end.